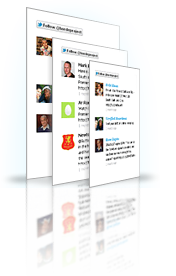 What is Podnova Twitter Widget? - Preview your widget, copy its code, and paste it into your website. You can see our widget in action by visiting The Horde Project: open the page and look for "Powered by Podnova twitter" on the right-hand side. Unfortunately, this widget is not available at this time. Please provide your email to be notified when this widget is released.